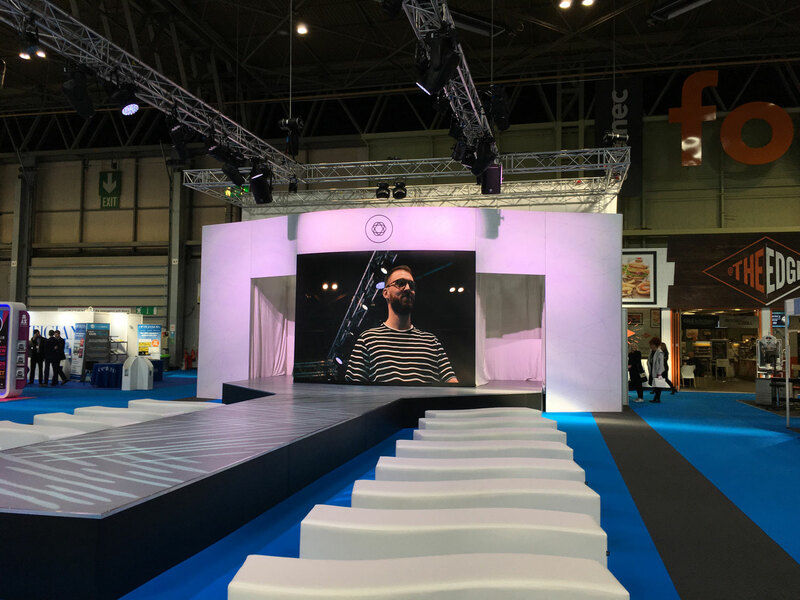 Our team designed and built the Spectrum Catwalk feature area for the 40th anniversary edition of the optical professions leading event. The centrepiece curved LED screen comprised 54no. Absen M2.9 Pro curved panels rigged using a ground support system and dressed by a custom graphic surround. We used curved Tension Fabric System frames to follow the curvature of the screen and produce entrance archways onto the catwalk. 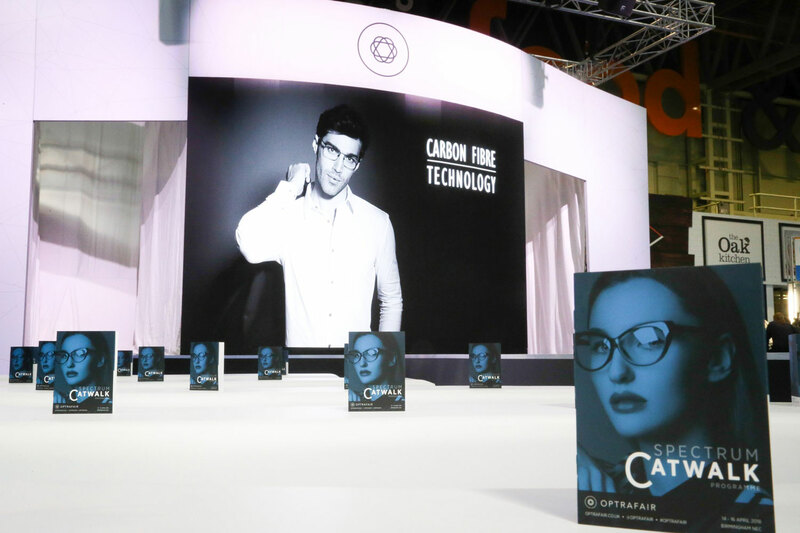 The catwalk itself was constructed using LiteDeck staging, finished with foamex fascias and a professional dancefloor-grade flooring vinyl. Chauvet Maverick MKII spot fixtures provided a range of dynamic lighting options alongside complimentary Chauvet Colorado Zoom LED washes. Compact EV ZX5-90B speakers were used for the PA. The screen comprised 54no. Absen M2.9 Pro curved panels rigged using a ground support system and dressed by a custom graphic surround. We used curved Tension Fabric System frames to follow the curvature of the screen and produce entrance archways onto the catwalk. 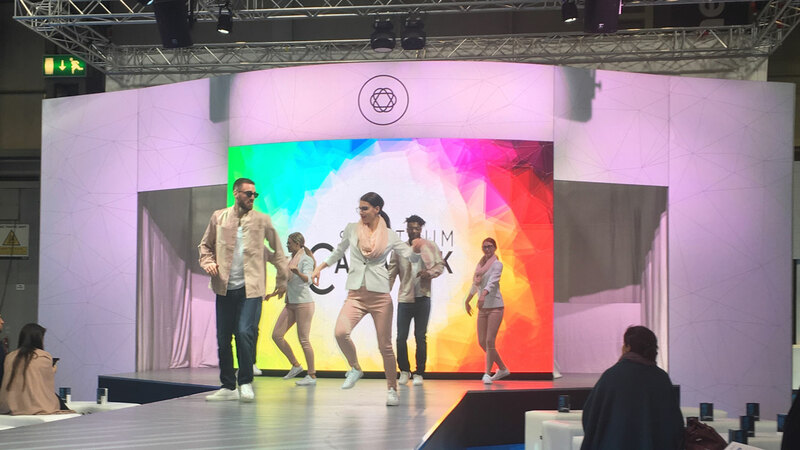 The catwalk itself was constructed using LiteDeck staging, finished with foamex fascias and a professional dancefloor-grade flooring vinyl. Chauvet Maverick MKII spot fixtures provided a range of dynamic lighting options alongside complimentary Chauvet Colorado Zoom LED washes. Compact EV ZX5-90B speakers were used for the PA.